There are some days when the need to write just takes over. Today is one of those days, so I dust up the cobwebs of my memory to dig up the password to this now rarely visited place. There are so many things I want to capture, so many little things you do and have been doing, so many ways you are growing and learning, so many reasons you give us to be proud and happy. This past year has been a year of emotional learning for you. You have this deep seeded kindness in you, where you are unfailingly nice to your classmates. Due to this, people come become friends with you. It’s a slow process, but in the end without you trying, you always have friends around you. This year though, you learned that not everyone does and goes about friendships like the way you do. You learned the grays of friendship. It was a hard lesson to learn, one you struggled with. Why would you do something that is wrong, was a question you asked me over and over again. Through endless drama, lots of tears, and repeated struggles – you finally found your footing, and stood strong for what was right, not bowing down to the popularity contest at school. You in fact, want to stay far away from the popular kids at school, and if not that, then not behave like they do. As much as I worry about what higher grades, and different schools will bring, this gives me peace that you will find your way and be stronger for it. This past year has also been about you going deeper into a sport you love. You have always liked swimming, and had wanted to join a swim team for a while. The bottle neck was of course me. I did not know, if we as a family were ready for the time commitment it would require. One day you came back from school and asked me to search for ‘x’ swim team, call them and ask them if you could join. If you went that extra mile and found out about the place, well who was I to stop you. And so now we are a swim team family. You swim, I feel, non-stop. I sit, I feel, non-stop at the pool deck. As much as it gets too much for me inside the muggy pool sides, you love it so much. There is no time when given a chance you don’t want to go swim (or play in the water). Walking down the mall, sitting on the couch, while doing your homework – you suddenly break in to some stroke that you have been working on. You love to compete, swim meets are fun for you. You have times you want to improve and are so excited when you do make them, before of course moving the target forward a little. Your love for books is going strong. You finish 500+ pages books in about a day, so yeah you read about a book a day. But more than all the books that you read, it is interesting to watch you re-reading parts of book. You always have a reason on why you went back to a certain part of a book, and your reasons are my ahaa or oh wow moments. It gives me great joy to watch you reaching for the classics as well. You current favorite is the “St. Clare’s” series by “Enid Blyton.” Apparently the “Malory Towers” series is good, but not as good as the “St. Clare’s.” That these books are set in a school, with issues between friends and other classmates, and how different people deal with them, and what their motives are, resonates deeply with you. Your biggest gripe though is that you don’t get presents, only books – books from tooth fairy (as you pointedly look at me), books on birthdays, books for Christmas. Listening you complain over and over again, I asked you to let me know what present you wanted for Christmas. You though and though, came up with a number of ideas, went over their pros and cons, and in the end decided on a couple of books you really wanted. I put my hands up in the air, and gave up. Your one big love-hate relationship is with Skiing. You love to ski, you hate the cold, and the fact that Bugz is never cold, while you are freezing, upsets you no end. You are a confident skier, but are a caution one too. You stay watchful and go ahead where you feel confident, unlike a certain someone who goes full throttle and worries about the consequences latter. If we could sprinkle powder all over the mountains, but made them a balmy 50 degrees – you would be in heaven. This past year we have been to so many different ski resorts and you have enjoyed them all. From having waffles at the top of Whistler Mountain, to seeing -18 degrees at Jackson Hole; from skiing fluffy powder at Alta/Snowbird, to skiing under wast blue skies of Big Sky; from the fanciest ski lodges at Sun Valley to skiing 12 inches fresh snow at Squaw Valley; from skiing 45 degree steeps on our local mountain to skiing the volcano of Mt. Bachelor – You have cried from the cold, been bribed by promises of hot chocolate, you have kept going, and skied with speeds that I have given up any hope of catching you while on the slopes. Over the past year, you and me have started our little talks. No more the little baby talks, but heart to hearts. Every time you are working on some emotional issues, you ask for my time. We find our little corner, some times in a quite room, most time it is the kitchen counter while I do meal prep. You lay out your thoughts in front of me. I give you a different perspective (sometimes), or advise from my experience, sometimes I just listen. We had a rocky start to this, because you thought I did not understand, but we are getting to understand, and that helps. Now every time a friend is in trouble, your biggest advise to them is to go talk to their mom. “Mom’s do understand, and have the best advise,” you tell them. Does my heart a world of good to be able to help, but most of all I cherish our talks and your time together. That you trust me, is my biggest gift. You are tall, athletic, and beautiful inside and out. You are serious, focused, and laugh at the craziest places. You are sensitive, kind, and sometimes totally spaced out. You read non-stop, love to draw, and love to hear stories of the time when you were a baby. You swim, ski and are crazy about football. You love colored trousers, flippy sequin T-shirts, and sweatshirts with hoodies. You love mangoes, rasmalai, and banana ice-creams. You hate long ski lines, below freezing temperatures, and, Bugz bragging about not being cold. You hate peanut butter, caramel, and sweets with cinnamon in them. You can’t care about brushing your hair, go crazy brushing your teeth, and can’t dance with any kind of grace. Life is so amazing with you in it, and you are our joy. We watch you grow, and seeing you become this amazing person, gives us endless joy. Stay happy, stay healthy, stay you – Always! ..and it is such an adorable book. I sneak read parts of it while she was at school. Hundreds of kids who think Harry is real, who want Harry to come over their place, who are writing new spells for Harry. Mr. Harry Potter has taken over our house. Despite my misgivings she got her wish this summer and she read the whole series. She is too young for the books, I feel, but she insisted and read the seven books. Now that is all we talk about. There are detailed questions about things she does not understand. There are games about the characters, that she has made up. There are back stories she has given all the characters. ‘They only spoke about Harry growing up, but everyone has a story, right Mumma!’ Even Bugz who was least interested in all the happenings in the world of Mr. Potter knows that Ron and Hermione are the good guys, Diagon Alley is the place where good things happen, Quidditch is the best game there is and Dumbledore is the greatest wizard there is. The books do get dark as the series progresses and I was worried about how she would handle them. The biggest blessing came in the form of adults during her summer camps. Apparently people don’t think twice about giving spoilers about books. Way before she got to the end of any book, she knew who was going to die and sometimes the how. In her case it was indeed a blessing because she was mentally prepared for it. She was mad at ‘You know who’, ‘Bellatrix’, oh and Snape – so so angry at him! But the only time she shed a tear was on Dobby. That one she could not take. She shut the book and walked away for a good couple of hours. Then again the seventh book was the hardest she found to read. She took the longest time reading it and would not touch it for long durations in the middle. The child who figured out Santa and Tooth Fairy are not real, all on her own really wants the words of Harry Potter to be real. She wants to visit London and find the entrance to Diagon Alley. She believes that she will get a letter from Hogwarts when she turns 11 and is worried that she will be called a Mudblood. I ask her, ‘How she knows I am not a witch’ and she replies, ‘because you do everything by hand. Our house is not like the Weasley’s.’ When I insist that I am a witch and chose not to use magic, she asks me details about my wand. Why would someone pick dark magic over good magic she does not understand. Was Bellatrix every good? How could Voldemort not know he created another horcrux? The questions are endless and the passion never ending. 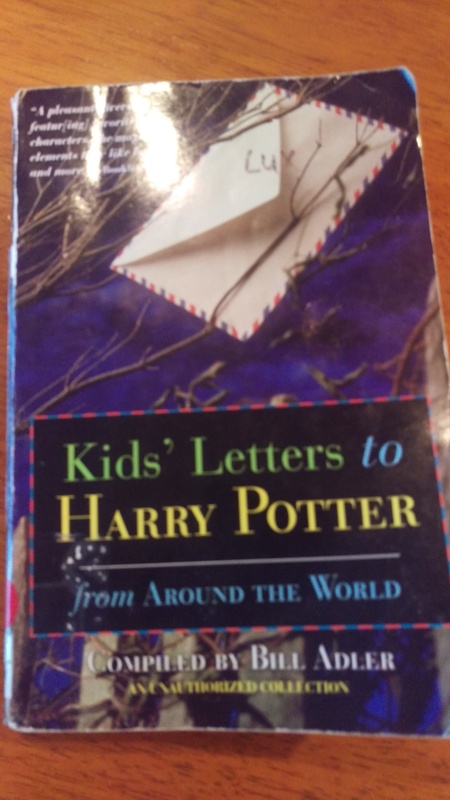 The world of Harry Potter has another avid entrant. Almost at the end of August, the 8th month of the year, and I write a New Year Resolution. Late am I, or what? A check for the New Year Resolution and how! We are so very proud of you sweet Buzz, so very proud!